We know that collective efforts aligned around clear goals and aspirations, informed by community voices and shared stakeholder accountability, create the most effective change. By becoming a United Way of Dane County partner agency, we collectively achieve this change. Our greatest strength is our partnerships and our shared work toward a better Dane County for all. By leveraging philanthropic resources identified and collected within its community, United Way of Dane County serves as a partner and investor of programs managed by non-profit 501(c)(3) health or human service organizations that provide services to Dane County residents. Programs developed, implemented and managed by the United Way’s non-profit partner agencies align with the objectives, goals and strategies identified within our community’s Agenda for Change. 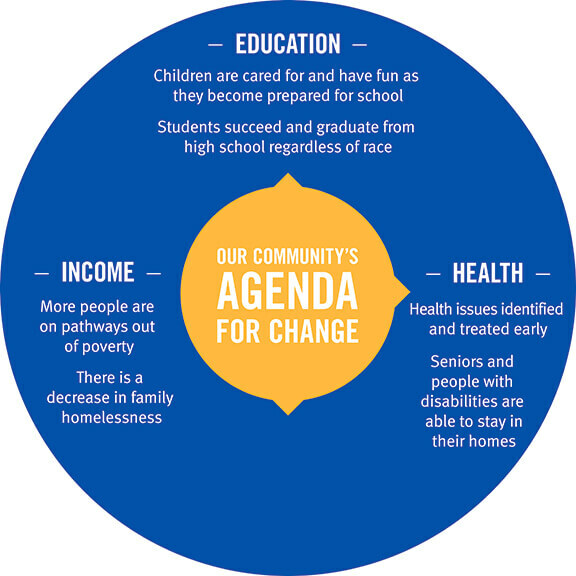 Each of the goals of the Agenda for Change are achieved through the implementation of United Way initiatives and program outcomes and measured through specific community-wide metrics, therefore ensuring that our results are effective, efficient, local, and focused on tackling the underlying causes of problems. The two different ways that an agency can participate in the United Way campaign are as a Fully Participating Agency or as a Donor Designation Agency. An agency becomes “fully participating” through the formal proposal review process and recommended for program investment by a team of citizen volunteers within our 6 Community Solutions Teams (CST), each aligned around one of the Agenda for Change areas. The goals of the Agenda are the priorities volunteers use as they review agency proposals and invest in their programs. The partnership with the “fully participating” agency is documented in an Agency Agreement and for some complex partnerships, a Memorandum of Understanding (MOU). The agency is accountable for the outcomes they have proposed or negotiated with the CST. Donor designation agencies affiliate with United Way for the purposes of receiving donor-designated dollars only. These agencies are reviewed by a group of volunteers to assure minimum criteria are met before affiliation is recommended. Agencies can request affiliation for designations in the public sector campaigns, private sector campaign or both. Each level of affiliation has different requirements, based on the different campaigns in which they are participating. Provide health or human services in Dane County. For statewide organizations, the agency must provide written documentation of its use of funds within Dane County. Be registered as a 501(c)(3) tax-exempt organization in the State of Wisconsin. Meet fundraising eligibility criteria for the State of Wisconsin for public sector affiliation. Address an established need in Dane County. Demonstrate the capacity to deliver services, including a clear mission and financial, programmatic and management stability. Serve people regardless of their ability to pay for services provided. Provide documentation by an independent auditor that the agency’s financial status presents fairly the position of the agency (ex. GAAP Audit). If concerns are expressed about the agency’s financial status, the agency must have written documentation of action either taken or planned to address those concerns. The Vision Council, a team of citizen volunteers, has discretion in the application of this criterion. United Way has a 2-year investment cycle which occurs in even-numbered years. In late spring, new agencies wishing to be considered for funding must submit a Concept Paper briefly outlining the program for which they are requesting an investment. The appropriate Community Solutions Team will then review the agency’s Concept Paper. If the team wishes to review the full agency/program request, the agency will be directed to an online form for a full proposal and description of the program operations in summer. This will be fully reviewed by our volunteers who will determine the amount of the investment in fall for the investment the following year. Investment recommendations are approved by the Vision Council and Board in November. Investment levels are confirmed in January once the final campaign projections are assured. For questions, please contact Elena Jimenez-Quiroz at (608) 246-4395. United Way of Dane County Foundation provides $10,000 annually from interest earnings to the Loaned Executives (LE) who makes a 1-time investment in special project grants. This grant process enables the current cohort of LEs to experience the volunteer decision-making process first hand; they understand the difficulty of making investment decisions and the importance of ensuring these investments have the greatest impact. The experience enhances their ability to communicate how unrestricted United Way dollars are invested to meet community needs. In 2015, individual agencies could request up to $2,000, while collaborative programs could seek up to the full amount of $10,000. Grant criteria are set by Community Impact Staff on a yearly basis aligning with one of our Agenda for Change areas. We publish the criteria for these opportunities in early July. This one-time investment is intended for non-profits, agencies, faith-based, community-based organizations and groups. Organizations submitting proposals are not required to have 501(c)(3) status. This investment process occurs in early August. By Youth For Youth (BYFY) is a committee of local high school students who will direct approximately $30,000 to projects generated, planned and implemented by youth groups benefiting youth across Dane County. Youth/youth groups can apply for up to $3,000 for a 1-year period. Each year, the BYFY committee sets investment priorities to meet the needs of youth in Dane County. In 2015, the committee focused on activities that addressed racial equality, educational achievement gaps, LGBTQ+ support & awareness, opportunities for economically disadvantage youth, raise cultural awareness and healthy lifestyle: supporting positive mental, sexual and physical health. Details for the BYFY 2015-2016 Request for Proposals will be available in early November on United Way of Dane County’s web site: www.unitedwaydanecounty.org/youth-service-programs/byfy/. The proposal deadline will be mid-December. Funding is made available through United Way of Dane County, Dane County Youth Commission, and the City of Madison Community Development Division.